When Liz Conway needs to get to the airport, she rolls her suitcase down the block, catches a Route 23 bus and makes her way east to the METRO Blue Line’s 38th Street Station, where she continues south on the train. Conway counts herself as an occasional rider of Route 23 – using it to go to dinner, the movies and other entertainment – but many of those who use the crosstown route say it is a fixture of their daily travels. Traveling eastbound, Route 23 runs from the Uptown Transit Center on Hennepin Avenue and along East 38th Street towards the Mississippi River. On the east end, branches go to Minnehaha Park and the Veteran’s Home or to Highland Park. In addition to the Blue Line’s 38th Street Station, the route crosses paths with more than 30 other bus routes and past retail areas, medical centers, schools and libraries in Uptown and Highland Park. Sandy Saline, of Hopkins, transfers from Route 12 to Route 23 in Uptown to the Minnesota Internship Center, where she teaches math, science and physical education. Beginning last fall, she began using the route to get to the Blue Line, which she takes downtown for paramedic classes. Saline takes the bus so her son can take the car to school in St. Paul, but doesn't mind letting someone else do the driving since it allows her more time to be productive. "It's an extra hour and a half of studying I get done every day," Saline said. Route 23 is also heavily used by students at Roosevelt High School and Wellstone International High School, located two blocks south of East 38th Street. Abdi Muhumed, a senior at Wellstone, is among those who use Route 23 to get to school . With a Student Pass, he gets unlimited rides on buses and METRO lines and can save up to continue his education next year at Minneapolis Community and Technical College. Saving money is also important to Tyler Botnen, who has lived car-free since arriving in the Twin Cities three years ago. Botnen, 25, recently moved to Highland Park to take advantage of its strong transit connections and because he knew Route 23 would provide a quick, one-seat ride to work. Using a Metropass, Botnen pays a flat monthly fee for unlimited bus and train rides and puts the money he saves towards rent, groceries and other living expenses. “Riding the bus gives me one less thing in my budget that I have to think about,” he said. Carol Lee can relate. Lee has lived in Minneapolis without a car since 1959, relying on buses as her primary way of getting around. 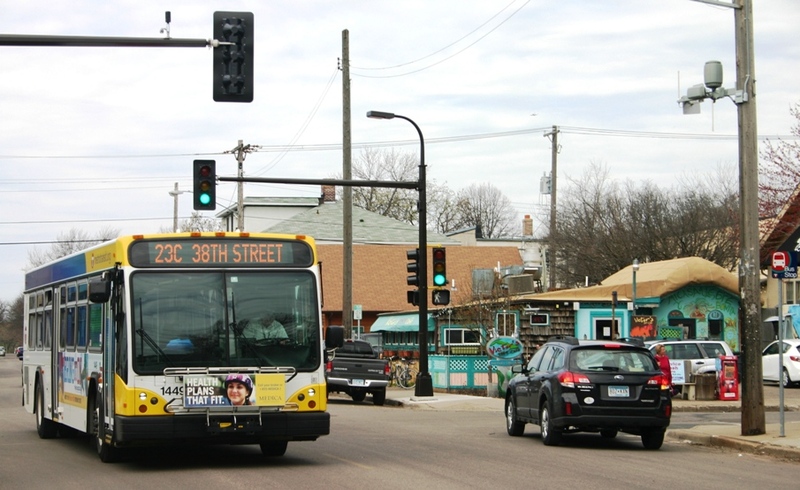 Lee takes Route 23 to get groceries at the Uptown Rainbow and to go to church at Sagrado Corazon de Jesus Catholic Church, at East 38th and Pleasant streets. For Lauren Flynn, the decision to begin taking the bus in December was motivated by a desire to reduce her environmental impact. 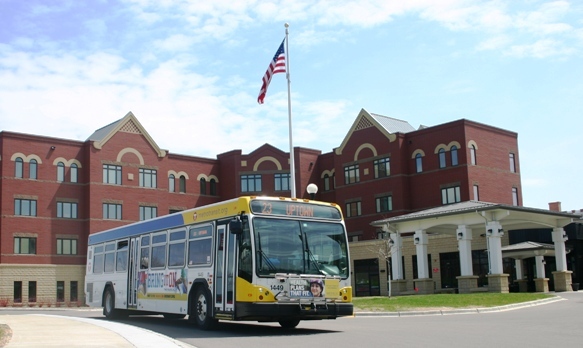 Flynn takes Route 23 to her job in Uptown and also uses Route 21 to get to St. Paul for work. “Anything I can do to use less fuel and counteract the badness is a good thing,” she said. 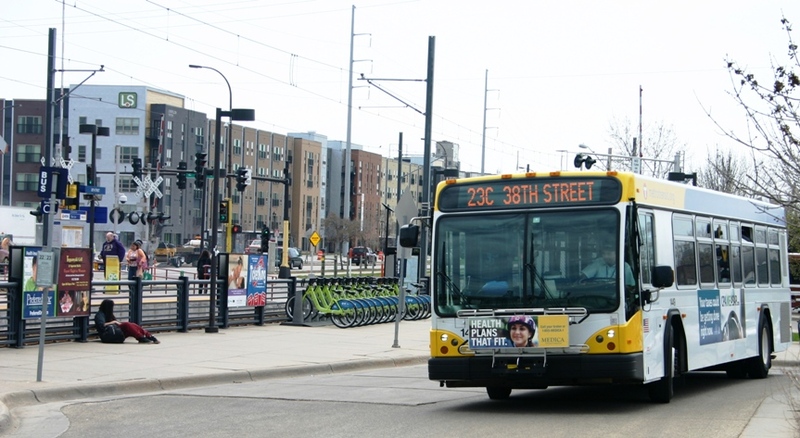 Emily Harris, who boarded Route 23 near Minnehaha Park, takes Route 23 and the Blue Line to work in downtown Minneapolis each weekday. Besides the convenience and cost savings, she said she enjoys sharing the ride with neighbors and other regular customers. “Everyone gets to know each other and it feels like a community,” she said. If anyone would know about the community on Route 23 it is operator Melanie Benson, who has driven Route 23 for the last 15 years and is on a first-name basis with many of its regular riders. Besides the people, Benson said she appreciates all the services that can be found along the route, including grocery stores, cafes and unique neighborhood hangouts, such as the Riverview Theater. “Pretty much all of the things you need to sustain life can be found along this route,” she said. Service: Route 23 runs between the Uptown Transit Center and St. Paul’s Highland Park neighborhood. Going eastbound, buses go south on Hennepin Avenue South, east on 38th Street, connecting with the METRO Blue Line’s 38th Street Station, and south on 46th Avenue. The ‘C’ branch continues south to the Minnehaha Park and the Veteran’s Home while the ‘H’ branch continues east on Ford Parkway to Kenneth Street. History: In 1926, buses began running on East 38th Street between Bryant Avenue South and 34th Avenue South. The route was later extended east to West River Road, the Minnesota Veteran’s home and Highland Village and west to Uptown. On the west end, buses initially ran to and from Uptown on Bryant Avenue; buses were re-routed to West 36th Street and Hennepin Avenue a decade ago. Future: Route 23 customers will be able to transfer to the A Line at a new station located at 46th Street and 46th Avenue and stations along Ford Parkway. Opening in 2015, the A Line is a Bus Rapid Transit corridor that will run between the METRO Green Line’s Snelling Avenue Station and the Blue Line’s 46th Street Station with service on Snelling Avenue and Ford Parkway.